16mm to DVD transfer. 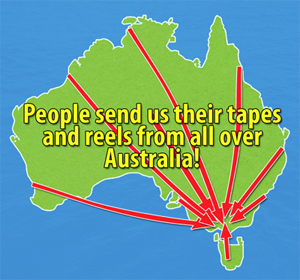 Melbourne, Adelaide, Hobart, Darwin, Brisbane, Canberra, Sydney, Perth & the rest of Australia. Get your film converted to DVD disc, file or hard drive today! Call us now on 03 9855 0006 to have your 16mm movie film converted into a digital file or DVD. We will carefully clean your film, inspect and repair any broken spices. Then we will transfer your 16mm film in real time while adjusting for colour and density. We offer a fixed price, no set up fees and no hidden extra's! 16mm was introduced in 1923 as a cheaper alternative to the 35mm movie format and 8mm was introduced in 1932 as a cheaper alternative to the 16mm movie format. If you're a baby boomer you will most likely have home movies of some sort on one of these formats and probably haven't seem them for some time. Why not get them put onto DVD and share them with friends and family? Popcorn not included. If you would like to know how much it costs to have your 16mm film transferred to DVD disc or digital file please ring PhotoQ on 03 9855 0006 to get a quote. We don't just transfer 16mm reels. We can transfer your old 8mm & 9.5mm reels to DVD disk, file or hard drive and Slides, negatives and prints to CD! We also transfer VHS, S-VHS, VHS-C, Beta, 8mm, Hi8, Digital8, MiniDV and Umatic tapes.